Founded in 1928, Genuine Parts Company (GPC) is one of the largest replacement part makers in the automotive, industrial, office equipment, and electronics industries. The company markets its products in the U.S., Canada, Australia, New Zealand, and Mexico through a large network including over 100 North American auto and industrial distribution centers and over 6,700 NAPA auto parts stores worldwide. Genuine Parts Company’s sales are derived from a diverse group of well-known industry brands including NAPA auto parts, Motion Industries (industrial components), and SP Richards & Company (office products). 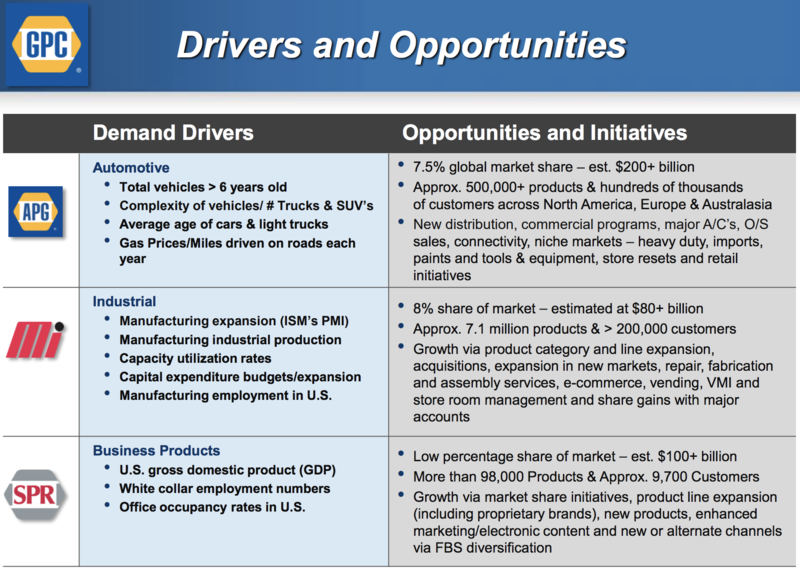 The company's most important business segments are its automotive (56% of sales) and industrial units (34%), which combine to account for 90% of company-wide sales and profits. Business products generate the remainder. By geography, North America represents the company’s dominant market, generating 83% of revenue. 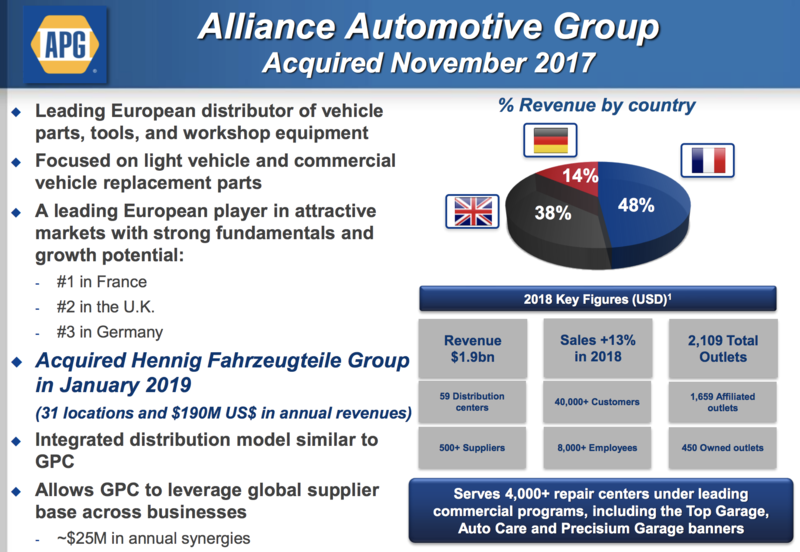 However, in order to expand its geographical footprint in Europe, Genuine Parts Company acquired the second largest European automotive parts distributor, Alliance Automotive Group, for $2 billion in late 2017. Genuine Parts has paid higher dividends for 63 consecutive years (including its 2019 hike), making the company a dividend king. Genuine Parts Company has managed to raise its dividend each year for more than six decades, an incredible achievement made possible by two of the company's main competitive advantages: its trusted brand names and massive distribution network. The company is a leading distributor to its four primary end markets with No. 1 or No. 2 market share positions (No. 3 in Europe) and an impressive reach in every segment. For example, NAPA auto parts has a total of over 8,000 global stores, serving more than 18,000 service centers. The firm's 2017 acquisition of Alliance Automotive added another 4,000 repair centers to Genuine Parts's customer base, increasing its distribution chain by about 20%. Genuine Parts has over 100 suppliers it uses to source more than 530,000 auto parts. This allows the company to serve as a one-stop shop for customers so they can get practically any auto part they may need. This is especially important in the most demanding part of the auto parts market, professional clients, which account for about 78% of sales. Professionals require rapid access to a large number of components which the firm's enormous database of parts and leading distribution channel can deliver more quickly and affordably than its rivals. Meanwhile, Motion Industries (34% of sales) was founded in 1946 and has a history of providing quality products to industrial firms like Halliburton (HAL), 3M (MMM), Coca-Cola (KO), PepsiCo (PEP), and Caterpillar (CAT). In fact, Motion Industries is closely tied into the entire global industrial base, with its components finding their way into roughly 7.9 million products around the world each year. The Business Products segment (10% of sales) has impressive scale as well, offering nearly 100,000 products to customers via 9,700 resellers. The company further deepens its relationships with distributors by offering key services like inventory management and point of sales offerings. This helps Genuine Parts to better stand out from rivals in a highly fragmented industry. As a result, Genuine Parts commands No. 2 market share in the office products industry. The other key factor contributing to Genuine Parts's moat is its supply chain and breadth of inventory. This is because NAPA auto parts work in an industry in which inventory management and just-in-time delivery are paramount. For example, an auto parts store generally doesn’t want to hold a lot of excess inventory because that represents a substantial capital investment. Similarly, auto repair shops generally order components as needed in order to service customers that just showed up in a timely manner. Genuine Parts Company’s large network of global distribution centers makes it possible for its customers to order parts at a moment’s notice and have them generally delivered the same day, maximizing their inventory turnover, sales, and profits. As one of the largest players, Genuine Parts Company can afford to hold more inventories and offer better delivery times than many of its competitors. And thanks to its extensive supply chain network, the company can even market more specialized and slower selling items because it can source them from nearby distribution centers, thus maintaining higher inventory turnover and greater customer loyalty. In addition, because auto parts and industrial components sectors are generally price inelastic, meaning that customers care far more about the reliability of products and the convenience of deliveries than they do about getting the absolute lowest price. This is partially because professional clients tend to pass on higher prices to their customers, helping Genuine Parts maintain its brand and pricing power over time. Combined with growing economies of scale, over time Genuine Parts Company has historically enjoyed steady and improving profitability. In fact, Genuine Parts Company's sales and profit have increased in 86 and 75 of the 91 years that the company has been in business, respectively. This helps explain the company's steady dividend growth, which is also supported by management's conservative payout ratio target of 50% to 55%. Additionally, unlike selling to original equipment manufacturers, the aftermarket business is relatively stable and generates great cash flow to support a healthy dividend. Vehicles and equipment break down and must be replaced. Therefore, the business is less discretionary than the auto sector in general. The automotive aftermarket has benefited from the improving reliability of vehicles over the decades as well, which allows consumers to own cars for longer, but only if they are properly maintained and repaired. As cars age, the cost to repair them increases, generating more demand for Genuine Parts. 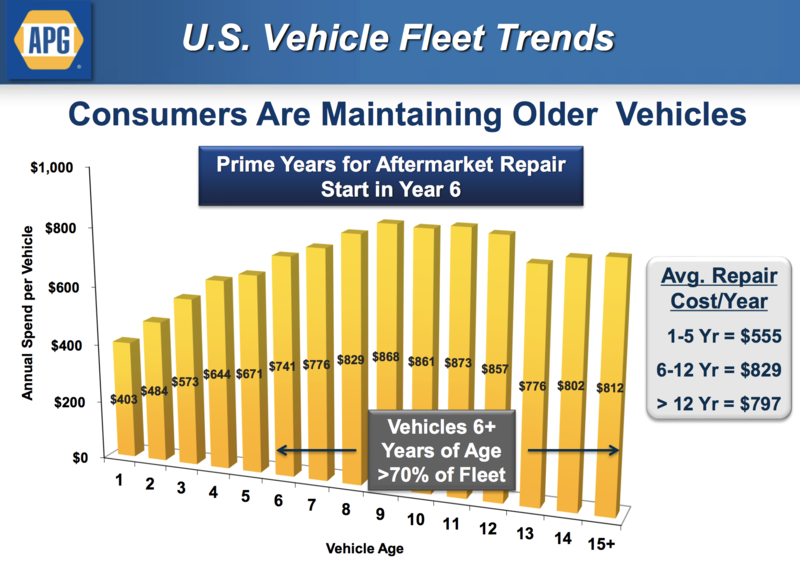 The average fleet age for U.S. cars is now 11.7 years and slowly climbing. Over 70% of the vehicles are over six years old, which means annual maintenance costs are, on average, nearly 50% higher than newer cars and trucks. And with the U.S. population slowly but steadily growing, and with it the number of vehicles on the roads, this creates a large, stable, and fragmented industry for Genuine Parts Company to service. 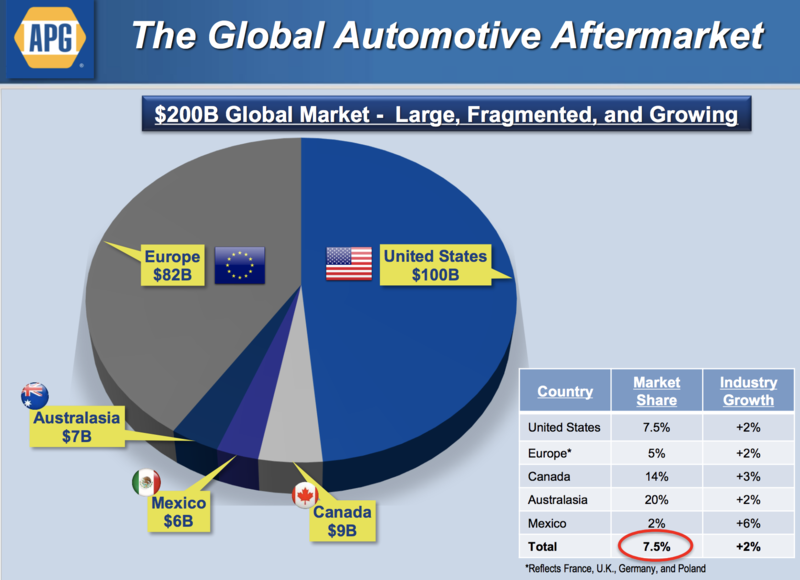 In fact, the global automotive aftermarket is $200 billion in size and growing about 2% per year according to management. Genuine Parts, despite its leading size, still commands less than 8% market share, providing a long runway for growth over time. The industry's fragmentation creates the opportunity for growth through acquisition, mostly small tuck-in deals. Since 2016 Genuine Parts has acquired over 60 companies, boosting its annual sales by almost $3.3 billion (and accounting for 95% of total company sales growth). Larger deals, like Alliance Automotive, have helped the company more quickly boost its store count, which is critical to increasing market share and profitability. Analysts expect the company's operating margin, 6% in 2018, will expand to about 8.5% over the next decade thanks to better cost cutting and economies of scale. The industrial components market is over $80 billion in size as well, and here, too, despite No. 2 market share, Genuine Parts commands just 8% of total global sales. In other words, continued bolt-on acquisitions could serve as a reliable growth runway for many years to come. Overall, Genuine Parts Company's businesses seem to operate in slow-changing industries and maintain dominant market share positions because of their extensive distribution networks (just-in-time delivery), leading range of products, brand recognition, and long-standing customer relationships. Combined with its conservative payout ratio and solid cash flow generation even during economic and industry downturns, Genuine Parts thus appears to be a potentially solid choice for conservative dividend growth investors. However, there are several important risk factors to consider. While Genuine Parts Company’s impressive growth record points to a disciplined and conservative management team, there are nonetheless several risks to keep in mind. First, Genuine Parts Company is historically a very acquisition-happy company, due to the fragmented nature of its industry. While it usually buys small companies, its $2 billion bet on Alliance Automotive Group in 2017 shows the firm is not afraid to occasionally make bold strategic bets. Besides its sheer size, this deal was notable because it shifts more of the company's mix into Europe, a region where Genuine Parts has not had much of a presence until recently. 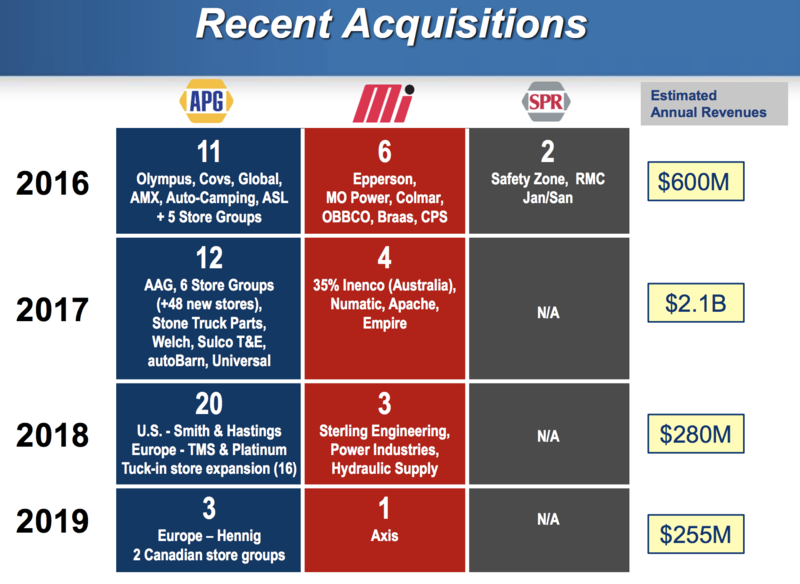 While Alliance Automotive appears to have many similarities to Genuine Parts Company, including a similar product mix, acquisitive growth strategy, and leading market share positions, there are no guarantees that the integration process and expected synergies will play out as management hopes. Fortunately, management's track record on M&A is solid, so the company deserves the benefit of the doubt. The company also paid about 10 times adjusted EBITDA for Alliance, which seems to be a reasonable valuation for this type of business. However, large-scale international expansion still comes with plenty of risks that need to be monitored going forward, especially if the company tries to make more Alliance-sized (or larger) deals in the future. Genuine Parts Company’s business can also be impacted any given quarter by volatile currency rates (25% of the business is now outside of the U.S.), industrial production trends, and the health of the auto market. While the aftermarket business is generally much steadier than the broader economy, the company’s industrial business is less predictable because the industries in which it operates can be highly cyclical, resulting in sales and earnings growth that can be a bit lumpy. However, none of these factors seem likely to impair the company’s long-term earnings power. Amazon is always worth a mention when discussing threats to distribution-based businesses. Fortunately, Genuine Parts Company possesses several advantages that seem to further protect its business from Amazon. NAPA’s extensive distribution network enables it to make rapid deliveries to repair shops (which require fast turnaround times for customers), the NAPA brand (which accounts for about 90% of Genuine Parts Company's U.S. auto aftermarket products) is trusted by shops and consumers, and having a brick-and-mortar location can help customers ensure they are purchasing the right replacement part (i.e. a hands-on shopping experience is helpful given some of the complexities involved in auto parts). Simply put, it would probably be challenging for even Amazon’s supply chain and logistics network to rival Genuine Parts Company’s given the quick turnaround times demanded by customers and the brand equity Genuine Parts Company has built up over the decades. Meanwhile, another longer-term risk to keep in mind is that NAPA auto parts specializes in components for traditional, internal-combustion engine (ICE) vehicles. In the coming decades, electric vehicles could account for a large and fast-growing segment of the global vehicle market. In fact, according to data from Bloomberg, electric vehicles are projected to cost the same as their internal-combustion counterparts by 2022, potentially creating an inflection point for demand. The risk for Genuine Parts Company is that electric vehicles are generally more reliable and less maintenance intensive than ICE cars because they have far simpler designs. As a result, cars may last longer and require less aftermarket parts in the future. Fortunately, this risk doesn’t seem like one that will materially impact the company for many years, if not decades, given the low penetration rate of electric vehicles today. The rise of driverless cars is another long-term risk and could result in a significant number of consumers subscribing to car-sharing services, in which fleets of electric vehicle robo taxis ferry them wherever they need to go, at a much lower overall cost than individual vehicle ownership. That, in turn, could result in the world’s total vehicle fleet size declining despite a still growing population. Self-driving vehicles would presumably be far more efficient and less likely to get in accidents as well, perhaps reducing needs for repairs. However, just like with electric vehicles, this risk is likely far off in the future with many uncertainties. At the end of the day, the company’s large, highly fragmented, and slow-changing markets help mitigate most of these risks. Over the short to medium term, the biggest area to watch is Genuine Parts's ability to profitably grow its business in international markets. This is critical to the company's ability to achieve management's long-term financial targets. Genuine Parts Company generates consistent free cash flow, maintains a conservative balance sheet, operates in a slow-changing industry, sells relatively recession-resistant products (as far as industrial firms go), and has grown its dividend for more than 60 consecutive years. As a diversified global distributor, the company should continue to benefit from serving a broad range of fragmented markets as well, especially with new growth opportunities presented by its acquisition of Alliance Automotive Group. Simply put, it’s hard to find a more reliable dividend grower than Genuine Parts. While the company's growth numbers will never dazzle shareholders, slow and steady often wins the race.